More than ever, the pinnacle of spinning reel performance. 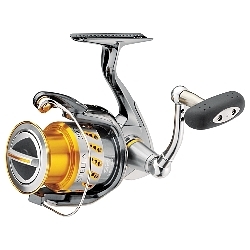 With the enhanced smoothness and durability that comes with Shimano's new Paladin and Propulsion systems, plus the solid back wall provided by the advanced Aero Wrap II worm gear oscillation, the Stella ranks among the best-handling reels ever created. The magnesium frame and side-plate, drilled aluminum spool with titanium lip, perfectly balanced "SR" design and shielded A-RB ball bearings combine to deliver precision long-distance casting, fluid retrieves and expertly contained fish-fighting ability like no other spinning reel on the planet. "You've heard the claims before,"advanced line management, Zero twist, further casting". I made a mistake of purchasing my first Stella back in 2000 and ever since then I've been spoiled. " "Awesome drag. More power than any conventional reel! Need a faster retrieve use the 10000. well worth the money." "My wife made me buy the new Stradic & Sustain before she let me purchase this new Stella. The improvements and modern technology are incredible in the new model Shimano's. Back to the Stella, It will cast as well and far as nearly any low profile baitcaster with the exception of Shimano's DC series. Mated with a GLX 783 SJR this combo will work well throwing any type of jig, spinnerbaits, crankbaits, and will even work perfect with live bait applications."